What Food or Herb Contains the Most Phytoestrogens? Phytoestrogens are a food and herbal means of affecting the estrogen levels in your body. These substances have a weaker action than hormone replacement therapy or the estrogen that your body makes, and this can benefit you by blocking hormone receptors or providing a low-level estrogen effect. However, because these foods and herbs do have an effect on your body's hormonal function, do not take large amounts of phytoestrogens without consulting your doctor first. Phytoestrogens are herbs and foods that mimic the effects of estrogen in your body. Because they are weaker forms of estrogen, they provide a weaker stimulation of cell receptor sites. This can lead to two benefits. First, for those who have high amounts of estrogen, these foods competitively bind with receptor sites and decrease the overall effect of estrogen. That can decrease a woman's risk for breast cancer. Secondly, for postmenopausal women, phytoestrogens mimic estrogen enough to reduce the symptoms of hot flashes. Food phytoestrogens come from three different types of chemicals. Isoflavonoids come from soy products and other beans. Soybeans contain high amounts of phytoestrogens, as do most beans. 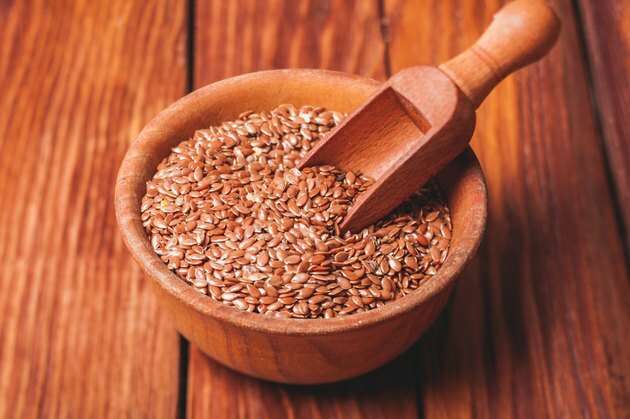 Ligans are another type of phytoestrogen and are concentrated in flaxseeds, but are also found in brans and other cereals. Alfalfa and clover sprouts contain a high amount of coumestan phytoestrogens, but you can find this type in split peas and lima beans as well. More than 300 foods have some form of phytoestrogens in them. Few herbs have phytoestrogen effects, but some herbs are mistakenly thought to fall into this category. Some herbs that have this effect include red clover, alfalfa, hops, licorice, thyme and verbena. Wild yam, saw palmetto and chasteberry do not have a phytoestrogen effect. Some herbs mimic some effects of estrogens, but are not true phytoestrogens, including dong quai, ginseng and black cohosh. Researchers study phytoestrogens most frequently in conjunction with breast cancer. Soy studies show conflicting results, and the studies are not well designed, according to Cornell University. Studies of women who eat soy products sometimes show a decreased incidence of breast cancer, but the studies were on small populations, focused only on Asian populations, and not many studies were conducted. Studies into lignan and coumestan phytoestrogens show promise in animal studies, but researchers need to conduct more human studies before a recommendation is made.